South Korean President Moon Jae-in and North Korean leader Kim Jong Un may soon talk directly through a hotline between their offices. Seoul and Pyongyang officials will discuss the installation of the direct line during their working-level talks on Saturday at the northern side of Panmunjom truce village, JoongAng Ilbo reported. [post_ads]The two sides had agreed to establish a line between their leaders to hold consultations and reduce military tensions and to hold their first phone conversation before their summit on April 27. 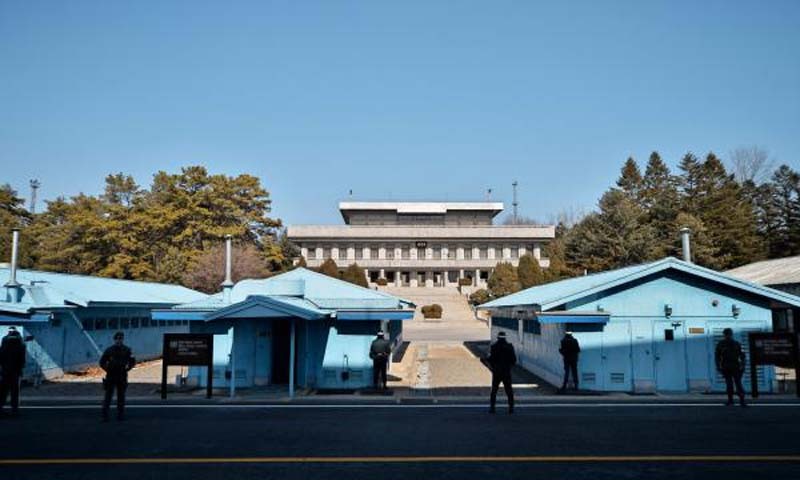 A Seoul presidential official explained that a communication line that currently runs through Panmunjom would be extended to Moon's office to establish the hotline. The official added that Seoul may install a separate telephone for the cross-border line "for the sake of symbolic significance." Prior to Saturday's talks, Seoul and Pyongyang are set to hold working-level discussions to prepare for their leaders' meeting. Seoul's Unification Ministry said Wednesday that North Korea proposed the two Koreas postpone the session to Thursday, a day later than originally scheduled. The North also notified Seoul that it will send a six-member delegation to the talks where the two sides will discuss protocol, security and media coverage of the summit. Pyongyang also suggested holding discussions on installing the hotline on Saturday. The ministry said Seoul will accept the North's proposal, adding that the South Korean government will make thorough preparations to ensure the summit is held successfully.